GitHub - Graylog2/graylog-plugin-aws: Several bundled Graylog plugins to integrate with different AWS services like CloudTrail and FlowLogs. Want to be notified of new releases in Graylog2/graylog-plugin-aws? Before, then looked like this "EU_WEST_2", now they are more readable with the actual location in them: "EU (London): eu-west-2". Also added a test to cover both the formatting and and value. Bumps [amazon-kinesis-client](https://github.com/awslabs/amazon-kinesis-client) from 1.9.0 to 1.10.0. Input plugin for AWS Flow Logs network interface connection logs. Input plugin for AWS Logs General CloudWatch logs. Input plugin for AWS CloudTrail configuration change logs. AWS Logs input: Reads a stream of CloudWatch logs from a specific AWS CloudWatch log group matching a particular log filter pattern. AWS Flow Logs input: Reads a stream of network flow logs for a VPC, subnet, or network interface. AWS entity translation: Looks up data for an an AWS entity. 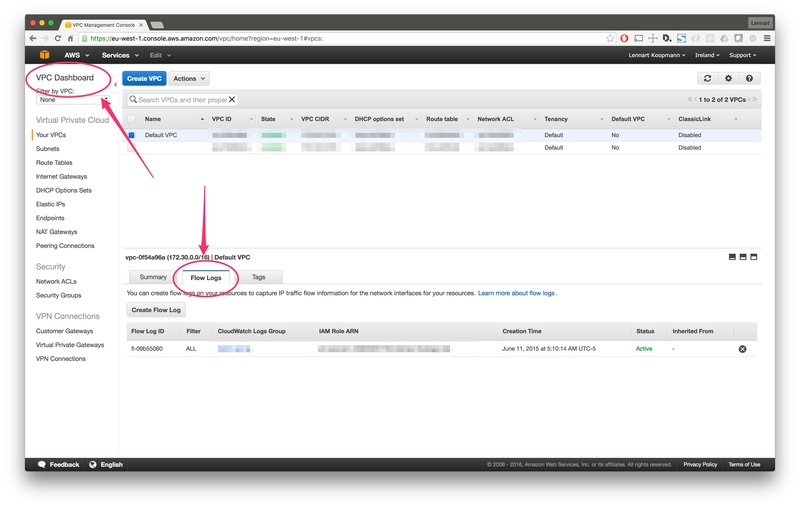 Note that the AWS access and secret key are currently not stored encrypted. This feature is following shortly and before the final release of v1.0 of this plugin. 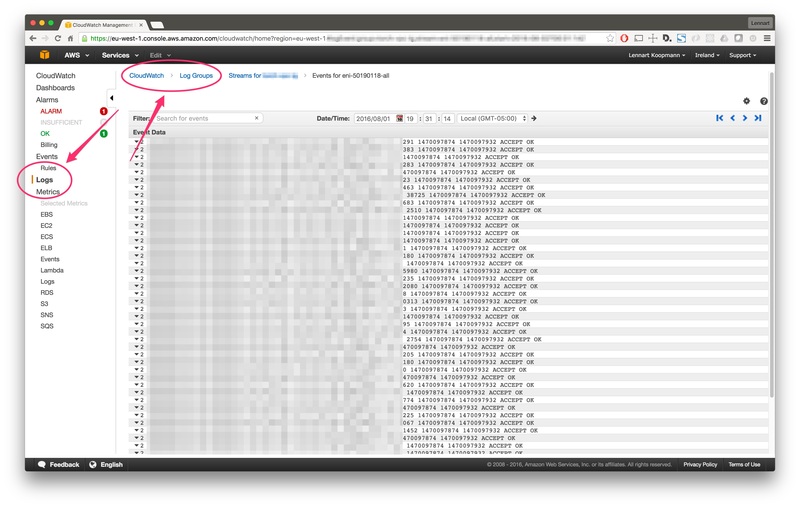 Graylog supports the ability to read AWS Cloudwatch logs regardless of where they originated from. As long as the logs end up in a constant CloudWatch log group, then Graylog should be able to read them. The log messages for a particular CloudWatch log group must be forwarded to a Kinesis stream (via CloudWatch Subscription filters) from which Graylog will be able to read and process them. 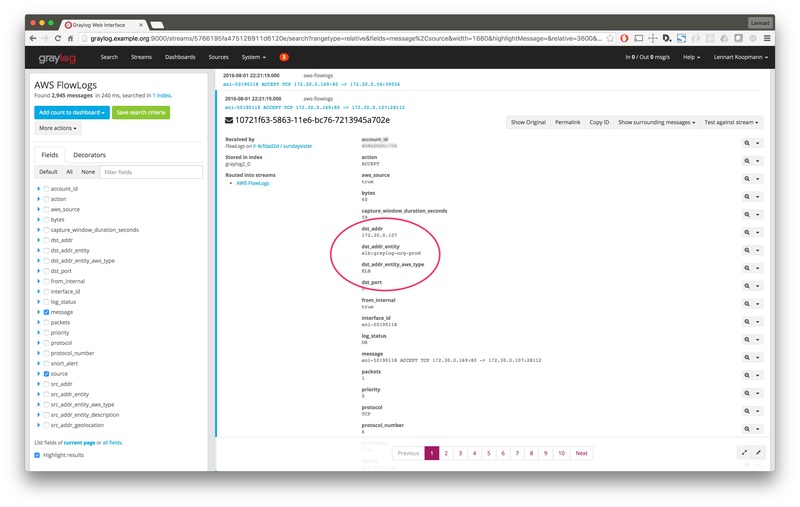 Using a Kinesis stream allows Graylog the ability to sequentially read the log messages. If the input is temporarily stopped, then started again, the input will continue reading messages were it left off (as long as the data retention period on the Kinesis stream is large enough). AWS Flow Logs and AWS Logs inputs both read logs from CloudWatch log groups. However, the AWS Flow Logs input internally uses a special decoder that parses fields from each message according to the AWS flow log message format. The AWS Logs input automatically parses the aws_log_group and aws_log_stream fields, and leaves the remaining field extraction up to the user to define. Several flow logs integration and analysis examples are described in this graylog.org blog post. This input uses the AWS SDK to communicate with various AWS resources. Therefore, HTTPS communication must be permitted between the Graylog server and each of the resources. If communication on the network segment containing the Graylog cluster is restricted, please make sure that communication to the following endpoints is explicitly permitted. You should now see Flow Logs being written into your Kinesis stream. Once the user is created, take note of the Access key ID Secret access key. You will need these to properly configure the input in AWS. 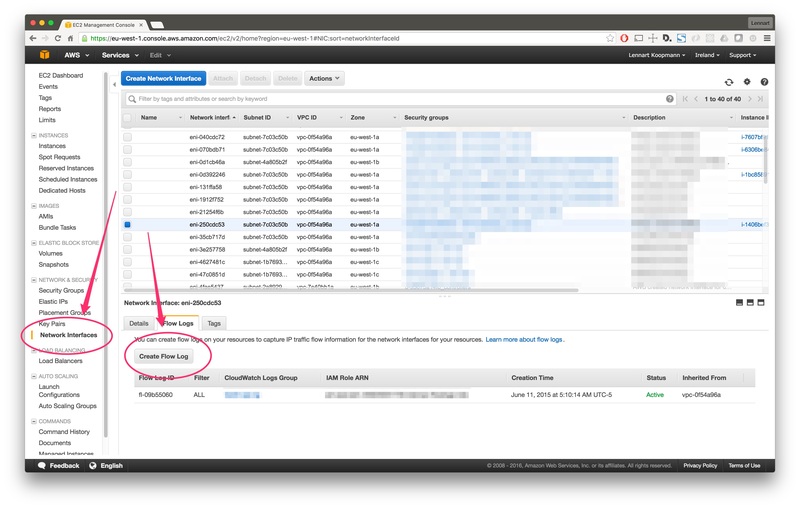 Now go into the Graylog Web Interface and start a new AWS Flow Logs input. It will ask you for some simple parameters like the Kinesis Stream name you are writing your Flow Logs to. Important: AWS delivers Flow Logs intermittently in batches (usually in 5 to 15 minute intervals), and sometimes out of order. Keep this in mind when searching over messages in a recent time frame. Starting in version 2.5.0, the AWS Flow Logs and AWS Logs inputs support the ability to throttle if contention occurs in the Graylog Journal. Throttling will slow the rate of AWS Kinesis stream intake for these inputs by pausing processing until the Journal contention is cleared when the node catches up. If the contention lasts for more than 60 seconds, then the Kinesis consumer will be temporarily stopped until the Journal contention is resolved. This setting can help to slow down the processing of large, intermittent log batches. If frequent long/disruptive throttling occurs, then additional hardware resources may need to be allocated to the Graylog node where the input is running. To enable throttling, edit the input and check the Allow throttling this input checkbox. See the Input Throttling section of the Graylog docs for more information about how and when throttling will occur. Right click on the new queue you just created and select Subscribe Queue to SNS Topic. Select the SNS topic that you configured in the first step when setting up CloudTrail. Hit subscribe, but make sure not to check the Raw message delivery option. See this AWS docs page for more info on raw message delivery. That's it! You're are all done with the AWS configuration. If the CloudTrail input is starting, and the debug log messages show that messages are being received, but no messages are visible when searching in Graylog, then make sure the SQS subscription is not set to deliver the messages in raw format.